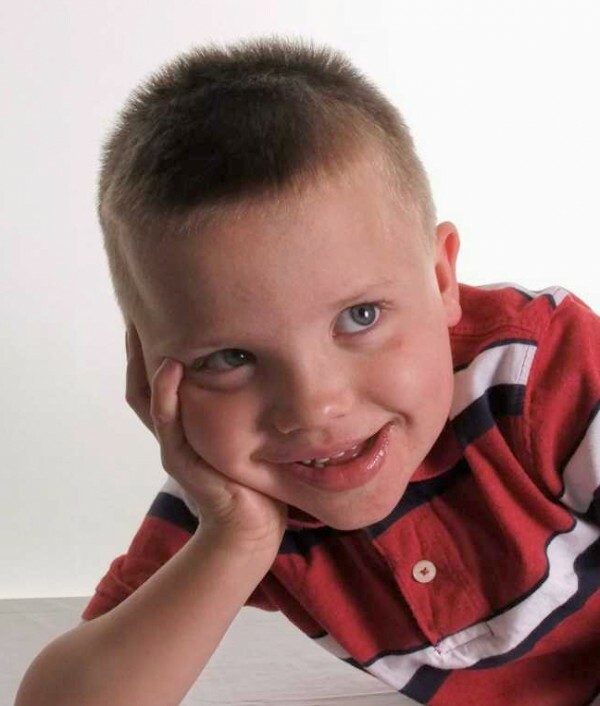 Interests - Zack currently loves balloons, helicopters, telephones, cars, stickers, simple puzzles and cooking. He enjoys all music, both listening and joining in! And ANYTHING to do with drawing! He also likes most shows on CBeebies. When Zack was diagnosed with A.L.L. in December 2007 we were all in a state of shock. His stomach had been distended and there was a possibility of Glandular Fever, so you can imagine our dismay at the actual diagnosis! All this just 10 days before Zack’s 3rd birthday and 15 days before Christmas. The hospital started his treatment immediately, but his initial reaction to all the drugs was dramatic and frightening as he fought for his life just 2 days later. However, round 1 over, we made it home for Christmas, only for him to collapse again just after Boxing Day and we had an ambulance ride back to hospital. After staying in hospital for another 6 weeks, he finally came home in February, our bald little angel, and he was in remission! The light at the end of the tunnel became brighter! Off his feet due to the chemo, Zack now needs a wheelchair a lot of the time, but has had a few good months while the dosage was reduced (an Interim Maintenance period). April ‘08 saw the next intense Chemo start and yes, it was back to hospital again, 2 stays of around a week each. If the A.L.L wasn’t enough, in the midst of all this, Zack was also diagnosed with something called Klinefelters Syndrome! This is a chromosomal disorder, which amongst other things, means our little boy also has speech delay problems and may have other learning difficulties in the fullness of time. Towards the end of 2009, he was given several more diagnoses (mostly, but not entirely connected to the Klinefelters). We now know he has Dyspraxia (difficultly with fine movements), ADHD (Attention Deficit Hyperactivity Disorder) and will near certainly have Dyslexia as well. And if all that’s not enough, he is also showing clear features of Autism Spectrum Disorder! So now we have a whole new raft of things to deal with (although it does make sense of many of the things he does – or doesn’t – do!). Life for Zack always seems to be an uphill battle but it should mean he gets a lot more help in his education. Throughout all of this Zack has been a true little ‘trooper’. He still has difficulty in expressing himself due to his continuing speech delay, but seems to have taken everything in his stride. He takes all his own oral meds and used to help the nurses with his central line (now removed). Life has been turned upside down, not just for us as a family, but for everyone around us. It has hit everyone from work (I had to give up my job) to all family members, even ones we haven’t seen in years! And although he is now at a main stream school, it continues to be hard both for him, his teachers and his fellow pupils. On a plus side, Zack is a ‘2012’ baby – he was born on 20.12.04. All children born on that date were eligible to register to be part of the ceremonies of the 2012 London Olympics and Zack has the certificate from them to prove it! All we need now is to make sure he’ll be there and taking part. Zachary – a boy so keen to love and be loved! What Post Pals has done these past few years for Zack has completely and totally amazed us day after day after day!!!!! You have genuinely been the reason for SOOOOOOOOOOO many smiles on my son’s face – particularly in the dark depths of his illness – and for that we will be eternally grateful. We can’t even begin to thank the totally amazing people who have been in touch with Zack for the past 3 or so years – you are ALL amazing! – but with Zack now being ‘officially’ referred to as a Cancer SURVIVOR, it is time to let other children still battling a whole host of problems have your attention! Please continue to put smiles on the faces of children who really need your help. Take it form a Survivor – it REALLY makes a difference!!!!!! THANK YOU ONE AND ALL!!!!!!!!! And a final thought… the latest results are Zachary:1, Cancer:NIL !!!!!!!!!!!!!!!!! Zack had an amazing Christmas – amazing in that it was ‘NORMAL’!! Ignoring his first two Christmas’s (because he was too young to understand them), the last four have been spent with him ill and/or in hospital, so a complete Christmas at home – no medications – no over tiredness – no hospital trips, it was BLISS for all concerned!! Just a shame he had to get to seven for it to happen! But get there he did!! In mid-December, two local charities arranged for him (and Dad!) to go to Lapland to play in the ‘Magic’ Forrest in the snow and meet Santa in Santa Land – INSIDE the Arctic Circle!!! What a day – Snowfights, Snowmen, Reindeer Sleigh rides, Huskie Sleigh rides, Skidoo rides, more snow, Santa, dinner and MORE chocolate and gifts than you can shake a stick at!! A fantastic and memorable day!!! And so now we are in 2012, hopefully our first complete year without the dreaded ‘Big C’ and associated drugs! It has been a truly rotten 4 years for Zack and all of us (not self-pity, just fact! ), but here’s hoping that is all behind us now!! We still have a lot of fights ahead of us over all his other problems, so we may not (yet) have won the war, but Zack appears to emerging triumphant from this battle!!! As ever – thank you to ALL who have shown an interest in Zack – I KNOW I’m biased – but he really IS one special little boy!!! Well, it has been a very long time since our last update and I apologise to everyone for that! So, what has happened in the last 6 months? Well, following the death of Zack’s Nana, we all headed of to the USA for most of July to sort out ‘affairs’, but then we took the opportunity to go to Orlando and spend two weeks having fun! Unfortunately, the Disney parks turned out to be a little to much for Zack who experienced several ‘melt downs’, but overall we all had a great time there. August saw us off for a week at CLIC Sargent House in Prestwick again, where – as always – everyone was wonderful. Zack got a chance to try horse riding (loved it!) and to hold several Owls (even Toby got to hold a little one!). We also moved home in August, so things have been really busy round here! Which means Zack has been through a LOT of upheaval, but I have to report that he has taken it all relatively well and has settled in his new home with little to no problems! His health (cancer wise) has been really good, although we did have (unfounded) suspicions that it had returned at the end of October! I guess we will be on ‘nerve ends’ for some time yet! His other health issues continue and he starts with the ‘proper’ Autism panel later this month – it will take around a year, but (hopefully) make a big difference. He is going from strength to strength at school and, although well behind an ‘average’ nearly 7 year old, he is doing really well! AND A SPECIAL MENTION – his school put Zack forward for the Wolverhampton Pride 2011 awards – and Zack WON the Child of Bravery award. We all got dressed up in out ‘best’ a few weeks ago for a special ‘do’ to receive it! So Zack hits SEVEN in December – it’s hard to believe that it is almost FOUR years since his diagnosis for A.L.L.!!!! As always, thanks to absolutely everyone who has taken an interest in our little boy – whether this is the first time you have read about him or if you have ‘followed’ him for years – or anywhere else in between – it really DOES make a difference to all of us here!! THANK YOU! Hello everyone! A lot has changed since Zack’s last post! Most importantly – on March 23rd Zack had his (hopefully) LAST EVER chemo!!!! We are now just on ‘follow ups’ and monitoring!! Hoooooooooorrraaayyyyyyyyyyyyyy!Of course, now all his other ‘problems’ take centre stage and have to be more urgently dealt with. Many had to be ‘held’ due to the chemo drugs and the effects anything else may have had on them. Zack is doing incredibly well at school and things generally seem to be on the ‘up’ for him! Sadly, his Nana (who lived in the USA) died last week and so Mum has had to travel out to deal with everything. She left a week ago and won’t be back for another 3 weeks. Due to his other issues, routine is VERY important to Zack and so, although he HAS been quite good here with Dad and Toby, things have been a bit more of a struggle for him and will be for a while yet. So life for Zack goes on!! Hopefully, the cancer will stay away and we can start to rebuild a more ‘normal’ life for him! As always, a million thanks to EVERYONE who has EVER sent Zack so much as an email – every single thing has been lovingly welcomed – it’s true – postie REALLY HAS brightened up a sick little boy’s life these past 3 years!!! His ‘battle’ is far from over, but hopefully it gets easier now! A special thanks to all you wonderful girls at POST PALS itself – you do an incredible job – especially with your own issues as well – so we cannot thank you enough for everything you have done for Zack and all the other kids too!!!! January passed by smoothly for Zack – no major health issues, the chemo’s (including his quarterly visit to Birmingham for a BIG chemo) went well and everything else is fine. This improvement in his general health can also be seen in other ways, particularly his mood! He has been sooooooo good these past few weeks – he has even received two ‘awards’ from school for good behaviour! And he has won a ‘Duckling 2’ certificate and badge for his swimming!! I can’t describe how proud we are of this amazing little boy! Unfortunately, it has been Zack’s brother Toby’s turn to stay in hospital – twice! Both times were down to viral infections that have made it very difficult for him to breathe (it was quite scary! ), resulting in regular nebulisers and then inhalers plus steroids for the second attack! So although we are pleased that Zack has done so well, we are a bit fed up that we STILL end up spending too much time in hospitals!! Oh well, hopefully Toby’s ‘thing’ is over now??!! Zack has finally been given his ‘final’ dates for chemo – the week of March 6th for his monthlies and then March 23rd for his final bone marrow check to make sure everything is ok. Then – NO MORE CHEMO !!!!!!!!!!! We are sooooooo happy and can’t wait! As always, thanks to everyone who has been in touch with Zack at anytime, but obviously January in particular – he had some wonderful post this month! If you could only see the smile that spreads across his face when he knows he’s got ‘Postie’!!! Overall, a generally great month in December and a fantastic start to 2011!! Zack thoroughly enjoyed the Snowdome and was genuinely ecstatic when he saw Santa! So we then knew that for the first time in his 6 years, he really ‘got’ Christmas!! But then our ‘good run’ ran out with a hospital admission at the start of December for what turned out to be yet another ‘unspecified’ infection! It really does come as a ‘smack in the face’ to be so rudely reminded of his illness when he has had such a good run! The good news is that we got it out of the way BEFORE Christmas and for the first time in 3 years Zack wasn’t ill over the holidays! After his hospital stay, we all got a treat from Acorns Hospice and Ryan Air by means of a ‘Santa Flight’ from Birmingham Airport! Zack had a ball (we all enjoyed it – even Toby) and met Santa yet again! Then we celebrated the 3rd anniversary of diagnosis. Followed swiftly by his 6th Birthday! And again, for the first time since diagnosis Zack was in good health and able to really enjoy himself! Mum made him a special Guitar Birthday Cake which had fireworks on it – he loved it!! And then there was Christmas itself! If there was any problem, it was simply that it was still all a bit too much for him! By mid morning, with half the presents opened, he had had enough (he was in ‘overload’!) and so the unwrapping was suspended till after dinner (much to Toby’s disgust)!! It took a few more hours to open the rest of the gifts under the tree. However, we were not done yet! On Boxing Day Zack opened the myriad of Post Pals gifts he had been sent but was just too tired to open on Christmas Day. And there were a few for Toby too! What a lot of truly fantastic gifts Zack and Toby received from everyone at Post Pals. Thanks so much (again!) to EVERYONE! Zack so enjoyed opening all his gifts and then playing with each and every one – we think he actually understands now what they are about (that complete strangers have found it in their hearts to be so kind) and it means a lot to this wonderful little boy. We are so lucky to have Zack here with us, tired or otherwise, and look forward to next Christmas when he will hopefully have been off his Chemo for 8 months or so! And now here we are in 2011!! What a fantastic start to the year we have had. A wonderful Charity called Adam’s Hats arranged for us all to go on a short holiday to a place called St Brides Castle near Haverfordwest in south west Wales. What a place!! It even had its own indoor pool which Zack frequented 9 times in the 5 days we were there! We ALL had a truly lovely time, even managing to spend time on the beach (all wrapped up of course!). A HUGE thanks to everyone who made it possible – it really meant a lot! But now we’re back to schooldays and chemo!! But GOOD NEWS – after Zack’s main monthly chemo at hospital in early January – he only has another TWO to go!!!! Hooray!! He still has a major ‘do’ with Birmingham Children’s Hospital and will have monthly follow-ups for a long time to come – but NO MORE CHEMO!!!! We can’t wait! As always, thanks to EVERYONE who has been involved with Zack in any way over the past few years, it has been a very trying time! Of course, his ‘troubles’ are far from over. We are only now beginning to realise how much the Klinefelters Syndrome will probably affect him throughout his life, but with the right help and support he (and we!) will get there!! Another ‘quiet’ month in Zachary’s life – even the lumbar puncture went as smooth as could be! So I have nothing to really report healthwise. Zack continues to improve in every other way – learning, sleeping, speaking – everything! So we are all really pleased here! And (thankfully) that is all there is to report for the month so far! However, this week sees him going to see Father Christmas at our local Snowdome (and a good old play in the snow!) and in a couple of weeks, Ryan Air will take him and some other lucky kids for a flight over the UK (and Santa will also be there again too!). Zack may turn 6 in December, but with the learning and health difficulties he has had in his short life, this is his first ‘true’ Christmas. He understands who and what Santa is and even understands the basics of the religious significance as well – so he’s getting really excited! It is soooooooo joyous to see our little boy being a ‘normal’ little boy getting excited! Our continued thanks to EVERYONE who keep in touch with Zack – that’s something else he has learned to be really excited about – post with a Z on it!!! October started with a short stay in hospital (with the usual unspecified infection!) but then got better! It has been a real month of changes for Zack – one brilliant one involves his sleeping routine. Since his initial hospital stay (now an incredible three years ago – almost! ), he has had huge separation anxiety at night time, meaning that Dad sleeps in his room with him – every night! Also, because Dad hasn’t wanted to go to upstairs at Zack’s bedtime every night, Zack has spent the last 3 years falling to sleep on a beanbag in the living room for the first few hours. Any changes to this have led to a terrified little boy! Well, towards the end of October, one evening Zack asked to go to bed. Mum volunteered to go to ‘her’ room if Zack went to his. Previously, this has always been met with an angry “No”, but he said yes! Thinking he would follow Dad straight back downstairs, we took him to bed and – amazingly – he stayed there (as long as he knew Mum was in the next room). He’s managed this for over a week now!!! He has also started to go upstairs during the day to play in his room ON HIS OWN – something he would never have done even a few weeks ago!!! And this is just two of many changes that we have seen in Zack in the last month – our little boy is finally not quite so little any more!! And we couldn’t be happier! Health-wise, after the initial ‘blip’, he has been in great form – not even suffering too badly from his monthly chemo! But he is due his quarterly trip to Birmingham Children’s Hospital for the dreaded Lumbar Puncture (and general anaesthetic) in the next few days. Ho hum! Overall though it’s been a brilliant month and he’s loving (and doing well at) school! September has been a pretty good month for Zack. His new school is excellent and he is really enjoying himself there! He even enjoys going to school and back ‘on his own’ on the school transport! Health wise, it has been a good month and he has generally been on top form, although thoroughly tired at night after his hard days at school. The last week has been a bit harder due to his monthly Chemo, but that is just to be expected. Zack has received a lot of post this month, so our thanks go out to all of you as usual for being fantastic people!! In short, August started badly but got much better! With just 5 days to go to our CLIC Sargent holiday in Scotland, Zack spiked a temperature and ended up in hospital for a stay – there was talk of him not being allowed home in time, but he managed with just 17 hours to spare before we set off on a 300 mile drive to Prestwick! The first few days there were not what they could have been. Zack was still not feeling at his best and still recovering from his hospital confinement!! But by Tuesday he had got past all this and had a ball for the rest of the week (as did Toby!). They both got to play with all the other children whenever they wanted and we even made friends with a family that only live about 15 miles away from us! Now we have been back home for a week and we all wish we were still at Malcolm Sargent House! It’s all back to normal now though. Zack had to have his monthly IV chemo this week and Kerri has never seem him react so badly to events! He screamed and fought like there was no tomorrow – it took his Mum, 3 nurses AND a Doctor to restrain him to get the cannula in! This has never happened to this degree before, but I think that after such a good week (because of his low blood counts, he hadn’t needed to take any of his meds while on holiday – except for a few pain related ones) he resented it all starting up again. Thankfully, when it was all over, he acted like it had never happened, but it really upset Kerri. We are now sooooooooo much waiting for all this to be (hopefully) over next February! In the early part of September, Zack starts his new school! He is quite excited – as are we!! Overall, what a good month July has been! Zack has generally been in the best of moods and had only low levels of pain right up to the last week of the month when both his monthly AND quarterly chemo kicked in (meaning two days in two different hospitals for treatment – including a general anaesthetic for a lumbar puncture!). Plus, his monthly 5 days of steroids and greatly increased pain levels! Still, all that is beginning to wear off now and he is calming down again. This month he got his first ever bicycle and he soon got the hang of it! Plenty of pads and a helmet in case he falls off (only once so far!) but he really loves it! Unfortunately, it was Toby who had a fall this month – resulting in a butterfly stitch smack between his eyes. Zack was great with him though, although he does obsess a bit with blood etc – can’t say we blame him after all he’s been through! Soon we will be back up in Scotland with CLIC Sargent, trying to have the seaside holiday he missed out on last year (see 30th August 2009 update). So fingers and everything else crossed that he has a great time this year (and us and Toby too!). As usual, everybody has been incredibly kind via Post Pals and Zack has had lots of Posty – which always cheers him up no end! And Toby got his first bit of mail too! So thanks to everyone! June started well enough and Zack even managed a day at the seaside and various other treats! Unfortunately, by mid-June, things had really taken a (thankfully temporary) turn for the worse. Zack has frequently been exposed to Chickenpox this year but we had always been aware of it enough in advance to ensure that he got the required medication to reduce the chances of him getting it. Well, this time he had been exposed and we didn’t know until the spots started!! Thus we had an extensive stay in hospital on IV drugs as Chickenpox is very dangerous in anyone who is immune compromised. It is really annoying and upsetting that it is the treatment that causes this – not the illness! Things got very serious for a while but he’s back home now and restarting school as well. So another huge scare but at least it’s behind us now. Unfortunately, the end of June was also the Post Pals party and a local charity – Acorns Hospice. Zack had been looking forward to both but was unable to go for fear of the possibility of infecting other poorly children – a risk we just weren’t prepared to take. Still, July is with us now and we can only hope that he will have an enjoyable month! He finishes in his local school and prepares to go to the new special school in September, so things are going the ‘right way’. Thanks to everyone who got in touch in June – Zack especially got lots of post while he was in hospital and it was all very much appreciated. Zack has spent the last few days in hospital with a severe temperature but was allowed home last night. Unfortunately, another BIG temperature saw him readmitted today where they are now confident he HAS chickenpox – which is of course a great worry, although he is in the best place for treatment. He is now on IV antibiotics and antivirals and will mean he’s in hospital for at least a week and then stuck at home for longer than that. This also means that sadly we won’t be able to make it to the Post Pals party this year. As our last update said, May started badly for Zack with him needing huge doses of anti-virals due to exposure to Chickenpox and then both his monthly and quarterly visits to hospital for heavy chemo. Inevitably that resulted in a ‘run down’ Zach for a while with much school missed. And then we had to contend with the possibility that his Leukaemia had returned! Thankfully, it hasn’t, but it was a tense time waiting – especially since at the same time they thought his brother Toby might have it too!! Again, he hasn’t!! After such a worrying start to the month, it all got better!! The second half of May has seen Zack reasonably pain free (as best as we can tell), although in the last few days he has started to need pain relief again. He has made it to school most of the time and has enjoyed running around and playing in the garden in the sun. Unfortunately, we start the monthly chemo again next week and he has to go into hospital for an MRI on his legs to try to find out what is causing the above average pain levels he experiences – yet another general anaesthetic! So hey-ho… here we go again!! As ever, the postie is being kept busy bringing things to Zack, who seems to be beginning to understand the significance of it all, as well as being excited that he has received something – so thanks to one and all for your wonderful support! Wow! What a month for Post Pals! Thanks as always to everyone who has been writing to Zack for a long time now, but following the Russell Howard show, I don’t think our Postman likes us anymore!!! Within about 24 hours the emails started arriving and a few days later the post started!! Zack has had sooooo many letters and gifts it is impossible to thank everyone individually, but please know that every single thing, no matter how small or brief, has brought a smile to Zack’s face! THANK YOU ALL SO MUCH. Healthwise, the month had been going reasonably well (of course, the usual chemo rages and aches etc) and he even managed 5 days without any pain meds!! We were a touch worried about it being the ‘quiet before the storm’ and we were sort of right. Two weeks ago Zack was exposed to Chickenpox at school and has had to start a massive two week dose of anti-virals that make him feel generally unwell and give him a stomach ache. A few unexpected visits to hospital have also occurred, most recently yesterday, resulting in a confirmation of conjunctivitis (eye infection), meaning he now has to have two weeks of eye drops that sting (we tried them!). This is one thing that really frightens him and we have to do it 4 times a day for the next fortnight! And it really is a fight – he get’s so upset but we have to do it anyway! Hopefully, this will all be over soon and he will have a decent May. Thanks yet again to all the posties and the wonderful people who make it all possible at Post Pals. Zack has had an ‘up and down’ sort of month. When he’s been ‘up’ things have been pretty good, but when he’s been ‘down’ …!! He has had lots of post though which has really given him something to smile about. His pain levels have been all over the place, from a handful of relatively pain free days, to times when he has trouble even standing and frequently falls over due to aches and pains. AND he still finds it almost impossible to tell us he’s hurting – we have to try and second guess him! On the good news front, there has been quite a bit in March! With all his learning needs, Zack has been allocated 15 hours specialist help per week in school, meaning that a specialist helps Zack with his learning as he is slipping further behind every day. However, even better news is that in the new school year starting September, he goes to a special school dedicated to his needs! This is a school that fully understands and caters for his educational needs and instead of being in classes of 25+ children per teacher, the maximum class size is 10 – with 3 teachers! We were a little concerned at first that Zack needed a special school but now that we’re used to the idea, we know that it will be brilliant for him and help him achieve his best potential. As always, we would like to thank EVERYONE for the interest and love they have shown our son, but we would like to give three REALLY big thanks to Acorns Hospice, React, and the Family Fund who have all been fantastic in supplying extra help to make Zack’s life a little better! Firstly, a HUGE thanks to EVERYONE who has sent something to Zack. Thanks to Post Pals, he can finally recognize his name (well – the Z at least!) and chases into the hall every time the post arrives! If only you could see the smile on his face when he recognizes there is post for him!! February 2010 saw our Zack coming ‘back’ to us! After a dreadful start to the year in January, Zack has been a lot better this month and has even regained most of the weight he lost (and he looks so much healthier for it!). The old twinkle in his eyes has more or less returned and his devilish laugh is back on full form! He is still in considerable pain but the meds seem to be controlling it reasonably well. We just wish he somehow found it easier to express the level of his pain, but he is still unable to do this. The doctors have agreed to reduce some of his chemo drugs (one in particular) to see if it helps his pain levels and so far it looks like it has. Of course, this means we have to be more vigilant for other things as a result! He has even made it back to school! He only managed 4 days there for the whole of the first half term, but made it in for three days last week (and one of the missing days was because he’s had to go to see his doctor!). We are now simply crossing everything that he can have an easier ride for a while! January has been a bad start for 2010 for Zack. Unwell over Christmas, he continued to be unwell throughout the month, indeed he only managed to go to school for 4 days in the entire month. Towards the end of January, Toby was christened, but Zack looked very pale on the day and was continually complaining of owwies (pain) and this culminated in a blood transfusion and a hospital stay for pneumonia. With his temperature yo-yoing like crazy, IV antibiotics and lots of serious pain killers seem to have finally caused the illness to ‘break’ and he seems to be getting a little better now. He has had everyone (including his doctors) worried this month and not even directly because of his A.L.L. It’s now the last day of January and the old Zachary ‘twinkle’ is starting to show signs of returning. We hope that February will get him back on form and we can move more positively into 2010! Zack had a great Christmas (with special thanks to everyone who got in touch and sent cards/gifts etc) and managed to stay out of hospital for the entire festive period and enjoy himself. Sadly, he wasn’t entirely well as he had a “tickly tummy” and ended up being violently sick (all over Dad!) on Christmas day and on Monday 28th (all over Mum’s car!). It didn’t spoil Christmas Day though and although it took quite a while to open the presents (it was all a little overwhelming for Zack), he had a ball! Unfortunately, the sickness (and the ‘other end’ too!) continued, culminating in Zack being admitted to hospital on New Years Eve for an overnight re-hydrating drip. Infact, Dad and Zack saw the New Year in with the cannula being inserted in Zack’s arm! Oh well – he saw the year out as he saw it in – in hospital!! Hopefully 2010 will be a better year! In other respects, December was a reasonably quiet month and we hope that that carries throughout 2010. Thanks to EVERYONE who has shown Zack support throughout 2009 – he looks forward to hearing from everyone in 2010! On behalf of Zachary H, we would like to thank EVERYONE who has been in touch these past two years since his diagnosis. With Zack about to celebrate his 5th birthday on Sunday, he has been very, very lucky to have such wonderful people to keep putting a smile on his face! Today is the second anniversary of Zack’s diagnosis of Leukaemia! We are so proud of our little boy and what he has put up with and achieved these past 104 weeks! Recently, the wonderful people at Post Pals sent us a special Chinese lantern that you have to light and when the paper balloon fills with hot air it lifts off into the sky. To celebrate, we went to a local park and ‘lit up’! It took a while to fill but then took off high into the sky and soon became a ‘star’ in the distance! It was fantastic (probably scared a few people wondering what it was too!). Thanks to everyone at Post Pals for making our son smile with great regularity – you are doing something so wonderful, you should all be so proud of yourselves! And also a HUGE thanks to all the wonderful people out there in the world who have taken the time to get in touch with Zack – you can’t begin to imagine the difference it makes! Let’s hope he has just one more year left of the illness and then we ‘just’ have to deal with all the other stuff!!! It has been a reasonably quiet month for Zack. Inevitably, he has come into contact with various children at school who have Swine Flu and so has had to have the vaccine and a course of Tamiflu. With 3 months of school now behind us, it is becoming obvious that he is steadily falling more and more behind. Various ‘experts’ are trying to sort out various levels of help, but unfortunately, this all takes time and so Zack won’t be getting the help he really needs until sometime next year. With the various new diagnoses that we had last month, all the problems he’s having now make much more sense! Unfortunately, these problems will always be with him to some extent or another. But, as always, he does his very best to be a happy little boy (of course, the various chemo drugs he takes can make that a real challenge) and everyone who gets to know him still falls very much in love with him. Zack has received some wonderful cards, letters and gifts in November, so thanks to every kind soul out there! Finally, this month sees his second anniversary since diagnosis and we can’t begin to explain how happy we all are that we get to celebrate his 5th birthday as well – we consider ourselves to be very lucky! Health wise, it has been a ‘good’ month for Zack – no temperatures or unexpected hospital visits – a wonderful change to August!!! He has also been in a generally good mood for most of the month too! However, we have been given yet more disturbing news this month regarding his long term future. As well as the Leukemia and the diagnosis of Klinefelters Syndrome, he has now been given a few new diagnoses (mostly but not entirely connected to the Klinefelters). We have now had it confirmed that he has Dyspraxia (and will near certainly be dyslexic as well), but he also has ADHD (Attention Deficit Hyperactivity Disorder) and is showing clear features of ASD – which is Autism Spectrum Disorder! So now we have a whole new raft of things to deal with (although it does make more sense of many of the things he does – or doesn’t – do!). But it should mean he gets a lot more help in his education. Poor Zack, it just seems to keep piling up on him! On a happy note, he has had lots of ‘Posty’ in October, including lots of gifts, both from Post Pals and others. As always, thanks so much for your kind thoughts. Also in October, thanks to Post Pals and Legoland, Zack enjoyed a wonderful day out at Legoland Windsor. He really enjoyed his day there and in particular the ‘Digger’ section where he got to actually use a ‘JCB’ – boy he loved that! A fantastic day out and all thanks to Post Pals! Phew! What a relief September has been after the dreadful August! With no hospital stays, reasonable health AND starting school (and enjoying it! ), Zack has generally been a much happier boy this month. We have had the usual fun of the monthly steroid rages which left his new teachers a little bemused at his sudden and intense changes of mood, but at least WE are used to that!! Now we just need to get his pain levels sorted (he is in some level of pain every day) and have to start considering more seriously his learning delays caused by the Klinefelters Syndrome – there’s always something! A HUGE thanks goes out to everyone who responded to last months posting, Zack’s appearance on the TLC page and his being a featured Pal. He has received an immense amount of mail and love from you all. If you could only see the smiles on our little boys face, you would realise just how special you all are, both to Zack and all the other kids on Post Pals! What a month – we are in no rush to have another one like August! In our last update we said that Zack had 3 hospital stays and no one seemed to know what was going on. August was supposed to be special – CLIC Sargent (Children’s Cancer Charity) had wonderfully provided us a weeks stay at their fantastic ‘hotel’ at Prestwick, about 35 miles south west of Glasgow. We arrived on Saturday the 8th and it is truly a fantastic place staffed by great people. Zachary quickly found the music room (full of every kind of instrument) and fell in love with it. Unfortunately, by the Monday we were up in Yorkhill Childrens Hospital in Glasgow where he had to have a transfusion and he (and Mum) stayed until Friday when he was transferred back to our local hospital in the Midlands! Worse was the on-off diagnosis that the leukaemia had returned!! That was agonising but Birmingham Childrens Hospital was able to confirm it hadn’t the following week. That was a hard week and a half – after all, if it HAD returned – this time we knew what it meant – real bad news. So the holiday Zack had really been looking forward to never came to be. Back home, he was released from hospital with the usual diagnosis of an unspecified infection (either bacterial or viral!) but was re-admitted again 3 days later where he stayed for another 4 days and another transfusion. Back home now (we’ve managed a week so far! ), we still don’t really know what’s happening, but whatever the infection is, it is really deep seated and we don’t think we’ve seen the end of it yet. After so many months of relatively no problems, this has come as a real shock and Zack has responded by becoming very dependant on us and gets upset even if left in a room alone for more than a moment or so! Although he tries to be his happy little self, he seems to have become more self-aware of his illness and it can really upset him. On a plus point, he (hopefully) starts school properly in September and boy does he look gorgeous in his school uniform. With his hair all grown back, he’s even had a haircut in readiness! As ever, Post Pals have been fantastic throughout and Zack has received a lot more post than of late – so many, many thanks to everyone who has contacted our son – we can promise it really makes his face light up when the postman calls! It’s been a mixed month for Zack. When he’s been well, he has been as good as could be expected. We were able to attend the Post Pals party on the 4th July where he had a wonderful afternoon and we got to meet some amazing people! Unfortunately, he has also had 3 admissions to hospital in July, including a prolonged stay in isolation with suspected Swine Flu (thankfully false!). Trying to explain to him why everyone we met wore masks and aprons was not easy due to his learning difficulties and left him scared. Then for his last visit they had no spare rooms and so for the first few hours we had to wait in… the Treatment Room. As Zack knows only too well what the room is used for, we had a very unhappy and panicky son on our hands! And after the 3 stays – no one is any the wiser as to what’s wrong! His temperature has spiked then plummeted and is now stable, but he is in lots of pain most of the time. He is on a constant rotation of Codeine, Paracetamol and Ibuprofen! Hopefully this will pass soon. Please keep Zack in your thoughts – we are sure it will all be ok, but for the first time in months things have become much more worrying than normal. Health wise, June was uneventful – no unexpected hospital trips etc, so that was pleasing. The effects of Zack’s Leukaemia and Klinefelters is now becoming more pronounced as his tempers become stronger! Life is becoming a daily challenge where Zack thinks he can win! He is a child who HAS to be busy – he just can’t sit quietly and read a book – he must be doing something. As Terry Scott once said – “He’s only good when he’s asleep (but you don’t know what he’s dreaming about, do ya?!)”. On an up note – we have to express our sincerest thanks to Post Pals, the NIA in Birmingham and the childrens entertainers – The Wiggles! Zack has had a strong fascination and love of The Wiggles for some time now. When we found out that they were playing the NIA, we contacted Post Pals to see if they could help us get a meet and greet. Within a few weeks, the NIA had donated tickets (we had not expected that) and The Wiggles had agreed to meet Zack before the show! And it all came together on the 23rd June. Wow – what a day. Zack couldn’t believe it! He was quite star struck – didn’t say a great deal to them, but was so impressed that he had met them. Then the concert itself was great – lots of Zack singing his heart out and general merriment! So a massive thanks to Post Pals (Vikki in particular) for helping to arrange a spectacular and memorable day out! It’s fair to say that most months are a ‘bit up and down’ for Zack! Overall he has had a quiet month but some unexplained vomiting resulted in a short and anxious stay in hospital. We never did find out what caused it all though! Dad had a week off work in May and so Zack became joined at the hip with him and they had a great time, even managing a trip to the seaside for a day. Zack loves the beach and dipping his toes in the sea! As always, a big thank you to everyone at and involved with Post Pals for all the happiness you bring to ill children everywhere! It really makes a difference. Yet another mixed month – up and down health wise (but generally up!). Not much more to say about Zack’s health this month. However, Zack now has a brother – Toby – born 24th April. Zack has been amazing! We really expected a green eyed monster as he has had Mum all to himself for such a long time (particularly since diagnosis! ), but he has been brilliant. He’s even desperate to bathe Toby and even change his nappy! There are the odd flashes of jealousy but overall Zack has made us proud. Another quiet sort of month for Zack. His blood counts keep bouncing all over the place thanks to the drugs and he ended up with another bout of hospital visits due to a severe respiratory tract infection (a bad cold!). He has a constant runny nose and a horrendous cough, but otherwise he is ‘getting on’ with living. His learning is coming on thanks to everyone who works so hard with him at nursery and we just look forward to seeing him grow to adulthood! We’ve had a quieter month with the post as well, but none the less the letters and gifts keep on coming and keep him smiling! They keep amazing us as well. In particular, thanks to someone’s generosity, Post Pals sent a wonderful brown teddy bear that he likes to hug! Zack has had yet another varied month. Apart from the usual Chickenpox scares, Zack was doing fine until the final week of the month, when an unspecified infection put him back in hospital for 5 days. You can ‘pretend’ that everything is fine and (with his new head of hair) that your child isn’t even ill, but a stay in hospital brings it all back! That and the fact that this time he really didn’t want to be there! He has developed a disproportionate fear of nurses and doctors (although now he has to have cannulas again we don’t wholly blame him!). Still, other than that stay, he has had another good month. The post continues to arrive and keeps him smiling and he manages to make most days to nursery if he doesn’t have any other appointments etc. He is undergoing many sessions and assistance for his learning difficulties caused by the Klinefeltes etc and has just had some special shoes to help with his walking and balance. One particular piece of post of note in February was a hand stitched cushion from ‘Stitches of Love and Kindness’ that was completely unexpected and wonderful. The kindness of strangers keeps going on and never ceases to amaze! Our continuing thanks to everyone. What a month January turned out to be! NO hospital stays (although Zack has come in to contact with Chickenpox again and so is back on huge Anti-Viral meds) and he had his Hickman Line removed mid-month – hooray! Now he can play like a proper little boy again without having to worry about pulling his line out etc. But the big event of the month was courtesy of the RAF. As you can see in Zack’s interests (above), he likes helicopters. Now when we say likes – make that LOVES! A chance meeting at a day out at the Air Museum at RAF Cosford led to him being invited to RAF Shawbury (near Shrewsbury) for the day – a helicopter training centre! A few days after having taken his line out, we went to the base where Zack got to visit the Air Trafic Control Tower, play on the Fire Engines (and put 5 small fires out! ), ‘fly’ a helicopter in the full size flight simulator AND had a flight in a real helicopter! In addition to all of that, 60(R) Squadron who had invited him on to the base for the day presented him with his very own flight suit with his own name badge and everything! He was ecstatic! The kindness and generosity total strangers are showing to our little boy never ceases to amaze us. Thanks to everyone yet again! We NEARLY had another ‘quiet’ month (medical wise) but unfortunately Boxing Day (26th) saw Zack back in hospital for 3 days for an unspecified viral infection. A bit of a let down after Christmas Day (we had to head off the hospital at 12.30am! ), but at least this year Zack got a ‘proper’ Christmas and thoroughly enjoyed himself. And that’s on top of an excellent Birthday a few days before! His hair is now decidedly noticeable and he keeps pointing to it! He has been put on a waiting list to have his Hickman (Central) Line removed, although that will mean a Cannula every month for the hospital administered Chemo! Oh well – we’ll just be glad that he can play properly again and not have to be scared of pulling his line out! Zack’s Birthday and Christmas Day were fantastic, with all the family turning up on the 20th to celebrate – Zack couldn’t believe his luck at all the attention and gifts he was getting! Prezzies! The past 12 months has been a real rollercoaster ride – from the terror that was diagnosis and the first few months when he was really ill, through the intensive chemo sessions and the hospital stays that followed, as well as the times when things have been a little better. We have seen him start ‘school’ (nursery) and also seen an amazing amount of love from total strangers via Post Pals etc. We are far from the finishing post yet, but – everything being equal – we will get there and Zack will have a long, happy and successful life! Thanks to everyone for your thoughts, care and prayers. Without being too repetitive (!) we would like to offer our sincerest thanks to EVERYONE who has taken the time and trouble to send Zack a card/letter/gift in the last six months but particularly in December – it has made such a difference to Zack but also to us to know that so many strangers care about our little boy! Special thanks also go to Zack’s Elf who picked some amazing Christmas gifts for him and also for the wonderful letters from the Reindeer! We ‘string’ our cards up on our wall for Christmas – this year we had two strings for us and five for Zack! Another reasonably quiet month for Zack! Although he did have a trip to hospital due to tonsillitis. With the worst of the treatment now behind us (hopefully) Zack is finally getting a head of hair again! Hooray – and in time for his 4th Birthday and Christmas too! Many thanks once again to everyone who has been so wonderful to Zack in 2008, the cards, letters and gifts have meant so much to us all. October has been a mixed bag! Zack finally took the last of his intensification drugs and even avoided any further stays in hospital! Then he had to have a short stay of medication due to a cold which meant he actually went 6 days without ANY dugs whatsoever – not even any pain relief! He hasn’t had any drug free days at all since diagnosis and it was great not to have to give him any. Of course he’s now back on the maintenance drugs and it will probably be another 2 years before he is drug free again, but my, how it felt wonderful! With the worst of the drugs out of the way, the light at the end of the tunnel just got a little brighter and we can only hope and believe that things get better from here. With Zack going to nursery 3 hours a day (and enjoying it), it is starting to feel all like a very bad dream that we are beginning to wake up from. Once again we owe great thanks to Post Pals – both to everyone who sent Zack something in October and to everyone ‘behind the scenes’ who make it all possible. It is always nice to see him race to the front door and find something addressed to him! Thanks everyone. September has been a difficult month. Zack has been on the 3rd (and hopefully last) intensification period of his chemotherapy and this time has reacted strongly! The most obviously noticeable effect has been all his ‘new’ hair falling out again but his ‘Steroid tempers’ and eating demands have been incredible. He is now on the last part of this dose of Chemo and the nurses have told us to expect a hospital stay in the next week or so! On the positive side, we have our fingers crossed that in the next week he will move onto the final (all be it 2 years) of maintenance drugs and life can begin to get back to some sort of normal. A small measure of that normality is that Zack started ‘school’ (nursery) and after a fraught few first days he is now keen to get there and enjoy himself. In addition, he has received some wonderful letters and gifts in September, most notably a beautiful quilt from Quilts 4 Leukaemia. So thanks to everyone for the wonderful efforts you all make. One final bit of news is that around April next year we are going to have to add a name to the sibling part of his page! Yep – he’s going to be a big brother! Unfortunately since I updated yesterday Zack has ended up back in hospital due to a temperature of 39C that they can’t get down. It’s not wholly unexpected during an intensification period of chemo, but an unwelcome event non-the-less. They are trying new antibiotics and taking more blood for cultures. In truth, I don’t think they really know what to do, so doing ‘something’ seems to be the only option to them! That sounds like I’m moaning but I’m not – they really are great nurses and doctors looking after him. Thanks once again for all the work and effort you all do on behalf of Zack and the other children – it really means a lot! August has been a mixed month, as we expected! The first half was good as Zack was on very little drugs, but with the re-introduction of a raft of Chemo in the second half, things have definitely got a lot more ‘moody’ here! The famous ‘Steroid Rages’ are back with us once again and Zack is definitely feeling ‘under the weather’. We still another 5 weeks of intensive drugs to go! On the plus side, we hope Zack will be starting school (nursery really!) in the middle of September and that this will help with some of his learning challenges. July was another (almost) quiet month for Zachary (thank heavens!). He has been on the lower ‘interim’ dose of chemotherapy and was due to start his final intense dosage at the end of July. However, catching Chickenpox and a two week massive dose of anti-viral meds means not starting the chemo until mid August. The lack of meds has meant Zack has been more of his ‘old’ self, but unfortunately that will all change again in the next few weeks (with some lengthy anticipated hospital stays too). We can only hope that this is the last of the big drugs and we will see a steady improvement after they finish in September/October. Wow – what a month for post! With Zack having been a featured pal, he now runs to check what the post woman has brought each day! A BIG thank you to EVERYONE who has found the time to put a smile on a little boy’s face. We are trying to get back to everyone we can – forgive us if it is taking a little longer than we expected. June was a relatively quiet month for Zachary. He has finished his latest round of intense chemotherapy and is just on a small daily dose until the end of July – his hair is even starting to grow back! Without all the chemo, his pain has dropped significantly and he is even getting more confident on his feet again. So for a while we hope we can have ‘our’ Zachary with us who can enjoy this part of the summer, without the need for much pain med’s and NO unexpected trips to hospital! Thank you to everyone who has been in touch with Zachary – we have tried to respond to everyone who gave a return address – it is VERY much appreciated! It is wonderful to see Zack smile! Zachary has suddenly become interested in when the Postman is coming! As I have said before – what a brilliant idea and how kind of all of you to do it on behalf of ill children everywhere! Although he is too young to fully understand why he is getting the posty, it really cheers him up and anything that can do that is brilliant!